Whether you are in the market for a wood fencing, vinyl fencing (PVC), Aluminum fencing, steel fencing, PBC fencing, ornamental or chain link fence, or you need to have your fence repaired, we can provide you with everything you need. From start to finish, we will handle your details of the project sales, permitting and installation and ensure that you are completely satisfied with our work. 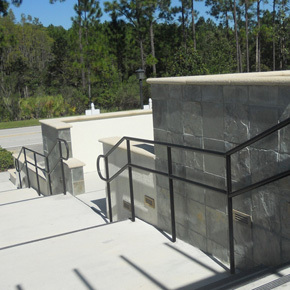 In addition, we also install stairs and balcony railings. The skilled professionals at David S. Smith Fence, Inc have been working with customers in the Orlando, Apopka and Central Florida area for nearly thirty years. We can handle any special needs fencing or preferences of commercial and residential clients, and we pride ourselves on offering exceptional customer service and quality fencing service. Check us out if you are in the market for aluminum fencing, PBC fencing, wood fencing, vinyl fencing (PVC), steel fencing, ornamental or chain link fence, and see why it makes sense to have a Smith fence! For additional information, visit our Sales, Repairs and Rental pages.